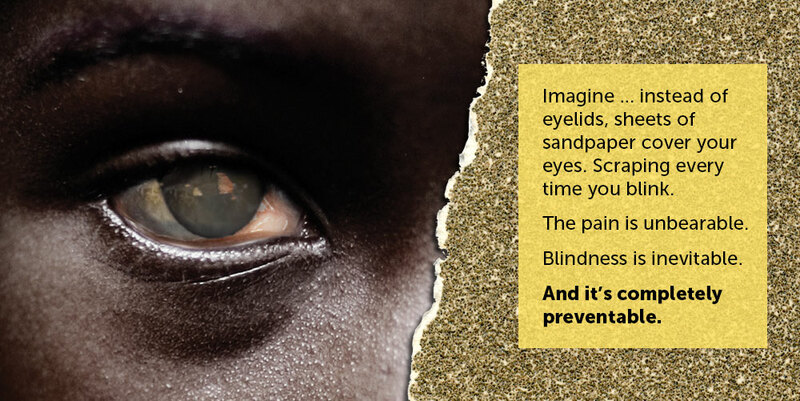 End the pain of trachoma today! Protect mothers and children like Anwar from blindness. 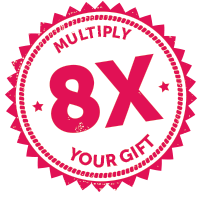 Your gift will be MULTIPLIED 8X in value. Flies are a fact of everyday life in impoverished communities like Amhara, Ethiopia. But they bring with them a painful, debilitating disease: trachoma. The flies are attracted to the mucus and discharge on the faces of children infected with trachoma. 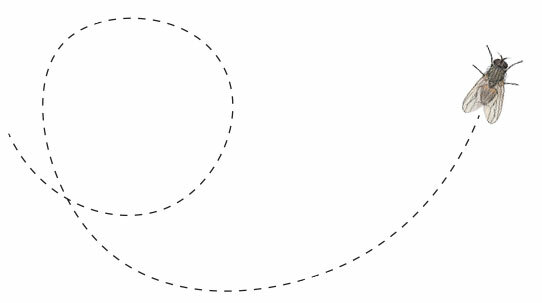 The flies pick up the infection and spread it to others. Soon, entire communities are struggling with this vicious disease. Many adults are left completely blind, unable to work or care for their children. But there is a solution – a way to save the sight of these boys and girls and those who care for them. Make 8X the difference in the lives of mothers and children today. Thanks to antibiotics donated by pharmaceutical company Pfizer Inc.™ your gift multiplies in value to restore the sight to eight times as many moms and their young children suffering from trachoma. Ansha’s six children rely on her to care for them. In order to do that, she needs to work their farm and sell her homemade cooking pots. But with every blink, trachoma is making her go blind. What will happen to her children then? You can prevent pain and blindness from trachoma, so mothers like Ansha can continue to care for their children. Flies carrying trachoma land near the victim’s eye or come into contact with the tears or dirty hands of someone with the disease. The infection causes painful small cuts on the underside of the eyelid, which then leads to scarring. The eyelid starts to turn inward. The in-turned eyelashes scrape the eyeball like sandpaper, causing pain and damage with every blink. As the cornea is cut and then heals, scar tissue forms, clouding sight and leading to permanent visual impairment. Eventually, the scarring is so bad that the cornea is destroyed. The victim is permanently, irreversibly blind. Your gift today will save 8X as many moms and kids from the pain and blindness of trachoma. Please give generously today to rush 8X the value of life-changing medication before permanent blindness sets in. By helping communities stop the spread of the infection, you can stop the pain and blindness of trachoma for good. Hope and Healing International is using the World Health Organization’s proven strategy to fight trachoma, which combines prevention and treatment. Eyelid surgery to stop the blinding stage of the disease. Pfizer-donated Zithromax® to treat and prevent active infection. Facial cleanliness to help reduce transmission of disease. Change to improve access to clean water and sanitation. trachoma is the leading infectious cause of blindness. people are at risk of trachoma. lost in productivity per year due to trachoma. country validated elimination of trachoma. countries reported elimination of trachoma. 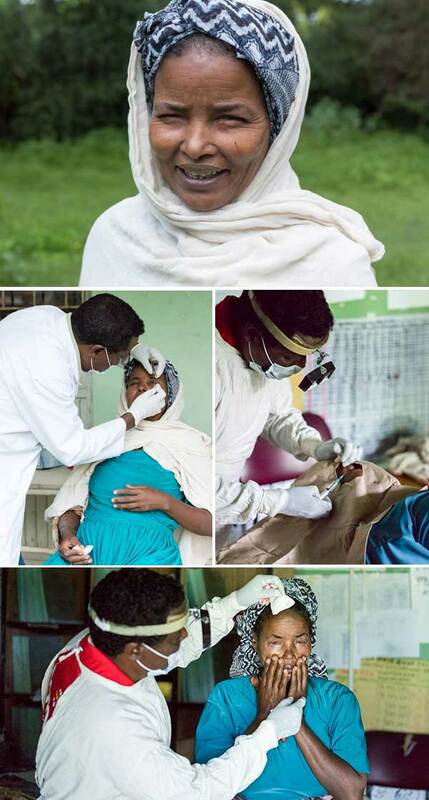 Bubula is a widow living in a small village in Ethiopia, the country with the most cases of trachoma in the world. She’s the sole provider for her five children. When she felt itching behind her eyelids, she knew the pain would soon follow. She’d had trachoma once before, and she recognized the telltale sign. She also knew if she lost her sight, she and her children would end up begging on the streets to survive. Then a community worker came to her village and announced a clinic day funded by Hope and Healing International. The nurse told her she had trachoma in both eyes. If she didn’t get surgery right away, she could lose her sight completely. The eyelid surgery lasted only 15 minutes, but changed the future for Bubula and her children. “I’m very happy. My eye pains are gone. Thank you so much,” Bubula says. Help more moms like Bubula be free of pain and blindness.